In mid-April I decided to attend the 33rd annual Ocean City, New Jersey, Doo Dah Parade, which celebrates the end of tax season. 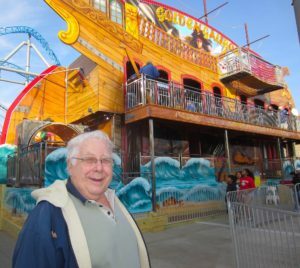 It kicks off the summer season for the city’s two amusement venues, Scott Simpson’s Playland’s Castaway Cove and Jay Gillian’s Wonderland Pier. It also marks the opening of an uninterrupted season of special events that stretches throughout the year. This long-running Doo Dah Parade is held every April and features marching bands, floats, and a brigade of more than 500 basset hounds. You know, those ungainly low-to-the-ground dogs with floppy ears. At the conclusion of the parade I walked over to Wonderland Pier to see what’s new this year. Nothing new, so I wandered down to Playland’s Castaway Cove. Their new S&S Gale Force launched coaster was being completely re-tracked, and the surrounding Wild Waves coaster by E&F Miler could not operate because of the construction overhead on Gale Force. But there was a new three-story Gosetto Fun House that had opened late last summer. Called Golden Galleon, I had yet to walk through it. I asked Scott if I could go through. It would be my first ‘ride’ of the year. He escorted me over and watched from outside. Golden Galleon is filled with obstacles, spinning, twisting, dropping and rolling floors, all sorts of tricks to manoeuvre through. I’ve loved fun houses all my life, but hadn’t done one in awhile. First challenge was to walk through a rotating barrel. I stumbled a bit, but made it through like a pro. Around the corner, the next element was a three metre floor of closely spaced rollers. I failed to look down, stepped on the rollers, and dropped like a ton of bricks. I landed on my keester and elbow. But that’s not the worst part. Have you ever tried to stand up when seated on a series of rollers? It’s impossible. So I scooted my way down the length of the rollers until my feet were on solid ground, pulled myself up, and let the children waiting behind me (who respectfully kept their mouths shut), pass by. Kids would only fall about half as far as I did, so probably thought nothing of it. Now I would watch where I was going. I plowed through several obstacle courses, over dropping and twisting floors, up and down two flights of stairs, and finally exited. I told Scott what happened and he was soooo sympathetic. He suggested I should stick to riding roller coasters where, being restrained, I would be safe. The next day I visited the Catanoso brothers’ Steel Pier in Atlantic City, 19km to the northeast. Here I rode their towering new 69 metre tall Wheel by Technical Park. From the top was a spectacular view of the Atlantic City shoreline. I’m pleased to report I exited the ride without a scratch.